The kickoff times for games will be announced during the season, usually within a 12-day window but occasionally within a 6-day window. This is determined by the Pac-12 agreement with conference media partners ESPN and Fox. Plan ahead and know how you are getting to the Coliseum. Use navigation and traffic apps such as Waze or Google Maps. Go Metro on Gameday. Take advantage of the Expo Line with two stops adjacent to the Coliseum. Exposition Park Lots are permit only. There are no cash lots at Exposition Park during USC and Rams football events. USC Campus has available parking during events. Rates and availability may vary per event. Get here early. Review policies, be prepared for metal detector screening and have items clearly displayed in a clear bag. Arrive at the gates no later than 30 minutes before kickoff. The Los Angeles Memorial Coliseum can accommodate patrons in wheelchairs or with restricted mobility. The Coliseum features multiple areas at Street level that do not require ramps or lifts to access. Situated at a midpoint between field level and the uppermost rows of the Coliseum, these areas can be accessed directly through accessible tunnels, which lead into the seating area of the Coliseum. These locations are situated around most of the circumference of the venue. On game day, patrons with a game ticket who require accessible seating will be accommodated on a first-come, first-served basis, based on availability. Please visit the Box Office located at Gate 29 for resolution. For guests that need additional assistance reaching upper level seats in the Coliseum, escalators are located adjacent to Tunnels 4, 11, and 19. During construction in 2018, the elevator is located adjacent to Tunnel 15 for disabled access only. Drop-off and pick-up for guests with disabilities should be made Exposition Park Drive after entering from South Figueroa at W. 39th Street. Please be aware drop-off and/or pick-up may be difficult due to heavy traffic and congestion. Due to post-game traffic patterns, pick-up in this area may be delayed up to 45-60 minutes after the game until streets can be re-opened for access. ADA accessible parking is available in Expo Park. Marked ADA spaces may not be reserved in advance are subject to availability based on arrival. USC permit holders may park in ADA spaces, provided they have a valid ADA placard to do so. Due to an extremely high demand for accessible parking, Expo Park is unfortunately unable to accommodate all of our guests, so please arrive early to ensure that you have a space in a lot. Please arrive with your state issued placard and identification, and parking personnel will guide you to your parking area. The fee for parking is $25. The Los Angeles Memorial Coliseum provides closed captioning services for all major events. To confirm that closed captioning service will be available, please email LA Coliseum with the event name and the date service is requested. Requests should be made at least one week in advance to the event date. The service provides text of all public address announcements during the game. You can access the service from your browser on any smart phone or mobile device. Data rates may apply. To access the service from your mobile device go to www.CaptionedText.com and enter Confirmation: 2650 (for English) at the top of the page. If you need assistance during an event, please text to (213) 263-4007. Data rates may apply. Assistive listening devices for fans with hearing or visual impairments are available for checkout at Customer Service located in the Coliseum West Administration Building across from Tunnel 11. Service animals are welcome inside the Los Angeles Memorial Coliseum. Service animals must remain on a leash or in a harness at all times unless either the handler is unable because of a disability to use a harness, leash, or other tether, or the use of a harness, leash, or other tether would interfere with the service animals safe, effective performance of work or tasks, in which case the service animal must be otherwise under the handler´s control (e.g., voice control, signals, or other effective means). If you intend to bring a service animal to the building, please notify your ticket representative at the time of purchase so that an aisle seat may be reserved for you if available. An animal relief area is provided at Gate 33 in the Olympic Plaza. Guests with service animals are responsible for cleaning up after their animals and for their appropriate behavior toward other guests and Coliseum personnel at all times. A failure to do may result in the animal’s removal from the stadium. The Los Angeles Memorial Coliseum is not responsible for the care or supervision of a service animal. The Los Angeles Memorial Coliseum is proud to provide assistance inside the stadium for guests with special needs. This service is free and can be requested through Customer Service. Disabled assistance is available upon request at all entry gates. To minimize your wait, we suggest that you make arrangements prior to the event you are attending by calling 213-747-7111 or email lacoliseum@usc.edu. During event hours, please call or text 213 263-4007. So that we may assist multiple guests, please be aware that our staff will not remain with you during the event, and you are not allowed to remain in the wheelchair during the event. In addition, the Coliseum does not rent wheelchairs or crutches. Any valid U.S. State or Federal Government issued I.D. Guests may not possess or purchase more than two (2) alcoholic beverages at a time. Shots may not be served at any time. Caps will be removed from all bottles. All glass containers must be poured into cups. All concession stands and portable units will stop serving alcohol at the end of the third quarter. For non-football events, alcohol cut-off times will be determined by Coliseum management. Alcohol of any kind may not be brought into or removed from the Coliseum. Any guest who is determined to be deliberately concealing alcohol while entering the Coliseum will not be permitted to enter the building. A person exhibiting visible signs of impairment will not be permitted into the Coliseum. Any guest who exhibits behavior that distracts or inconveniences, or otherwise, interferes with another guest’s enjoyment of the event may be removed from the Coliseum. Alcohol will not be served to any underage person or visibly impaired guest. Alcohol beverage sales may be curtailed or prohibited at the discretion of management. During USC football games, alcohol must remain within the Coliseum Club, Suite, or other defined hospitality areas. Service dogs or service-dogs-in-training for guests with disabilities are allowed. All other animals are prohibited. The Coliseum and University grounds and facilities may not be used for commercial purposes such as sales, advertising, or promotional activity without prior approval. Authorized corporate sponsors must be licensed in advance of the event. Violators are subject to trespass ordinances. For information about marketing activities during USC football or athletic events, sponsors should contact USC Sports Properties at (213) 821-5294. ATMs inside the Coliseum are located on the street level near Tunnels 1, 15, 19, 25, 28 and on the upper concourse level at sections 15 and 23. Baby changing areas are available at all Street level restrooms; and in Men’s and Women’s restrooms on the Concourse level at sections 1-2, 11-12, 14-15, 17-18, 22-23, 26-27. Bag Check areas will be made available on a first-come-first-serve basis on South Lawn (near Gate 23) and Lot 4 parking lot (near Gate 4). Bag check opens four hours prior to kickoff and closes one hour after the game. The availability of bag checks are subject to change without notice. A one-gallon clear plastic storage bag (Ziploc bag or similar). In addition to one of the clear bags noted above, guests may also carry in a small clutch bag or purse approximately the size of a hand, with or without a handle or strap. An exception will be made for medically necessary items after proper inspection. Prohibited bags include, but are not limited to: purses larger than a clutch bag, coolers, briefcases, backpacks, fanny packs, cinch bags, luggage of any kind, oversized seat cushions with pockets or metal structures, computer bags and camera bags or any bag larger than the permissible size. These measures are designed to promote public safety while encouraging guests to limit the items they bring into the venue to create a more efficient screening and entry process. We ask that all items are visible when entering the venue. The fewer items that are concealed, the quicker the process becomes. All approved bags are subject to inspection upon entry. For more information on the Coliseum Bag Policy, please visit www.lacoliseum.com/beclear. Do not contain commercial or political endorsement, messages or logos, obscene or indecent language, images, graphic depictions or incite violence, create danger or pose security risks. Not in the field of play. Do not obstruct the sightline of another guest. Do not cover up any existing signage. Not affixed to metal rods, wooden posts or any other material that could cause harm to other patrons. Not paraded around the Los Angeles Memorial Coliseum. They are not in poor taste as determined in sole discretion of the team or Los Angeles Memorial Coliseum. Bottles and cans of any kind are prohibited inside the Coliseum. Factory sealed bottles of water, 17 oz. or less, are allowed and limited to 2 bottles per person. The Coliseum Box Office is located at Gate 29 and is open Monday through Friday, 10:00 AM to 5:00 PM. Hours may vary based on events and are subject to change without notice. On game days, additional box office locations can be found at Gate 1 and Gate 19. Ticket Sales and Will Call typically open at least three hours before an event. All USC Football games (both Home and Away) will be broadcast live on USC’s Flagship Station, ESPN Radio 710, and the Trojan Radio Network. Check www.usctrojans.com for updates. Pre-game radio show will be broadcast live from the Trojan Fan Fest starting four hours prior to kickoff. Bus and oversized vehicle parking is by reservation only. Availability is very limited and there is a fee to park. Contact USC Game Management at 213-740-4174 for more information. Guests are allowed to bring still cameras provided they do not have detachable lenses and do not interfere with other guests’ view of the event. Camera lenses are limited to 3-inches. Video cameras and tripods are not permitted. All commercial use of photographs depicting game action are allowed only through a licensing agreement. Policies may vary per event without notice. Children who are two years of age and under are admitted free as long as they are held in a lap and do not interfere with other guests’ view of the event. Strollers are prohibited. Child ID bands are available at customer service locations. It is suggested that the band, ticket stubs, a nametag and/or any other additional information be pinned to the clothing of any young child that might require assistance. These measures will assist any USC personnel in reuniting guests should it become necessary. To report a lost child, please contact the nearest police officer or USC staff member, or go to customer service located at the Coliseum Administration Building near Gate 11. The Los Angeles Memorial Coliseum provides closed captioning services for all major events. To confirm that closed captioning service will be available, please email LA Coliseum at lacoliseum@usc.edu with the event name and the date service is requested. Requests should be made at least one week in advance to the event date. The service provides text of all public address announcements during the game. You can access the service from your browser on any smart phone or mobile device. Data rates may apply. To access the service from your mobile device go to www.CaptionedText.com and enter Confirmation: 2650 at the top of the page. If you need assistance during an event, please text to (213) 263-4007. Data rates may apply. It is a violation to stand in Tunnels or sit in Aisles per LAFD Fire Code 4701.4.1.3. Please keep all aisles and tunnels clear of obstructions. Your cooperation is appreciated. The Coliseum Clubs are exclusive areas where you can enjoy premium food and beverage service prior to, during, and after USC home football games. The Clubs open two hours prior to the game and close one hour after the game ends. Coliseum Clubs are located across from Tunnel 12, as well as on the north side at Gate 19 and Gate 33. The Coliseum Club at Tunnel 5 is closed due to the Coliseum renovation construction. All Clubs are easy to access, just show your TAF Member game ticket! Trojan Club members can only access Club 33. It’s easy to become part of the Trojan Athletic Fund! Contributors receive valuable benefits while helping to support USC Athletics. Only authorized personnel with proper credentials will be permitted on the field before, during, and after a game. Any unauthorized person going on to the field will be removed and subject to ejection and/or arrest. 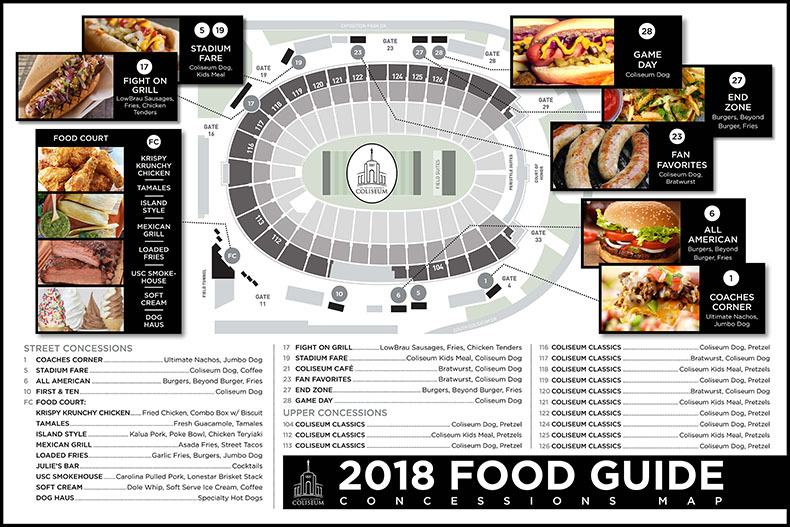 The fan food menus from Los Angeles Memorial Coliseum Executive Chef John Brenning are taking the gameday experience to new and exciting levels of flavor, with the addition of new offerings that reflect the dynamic modern dining marketplace and provide just what fans are craving. Chef Brenning and the Legends at LA Memorial Coliseum culinary team have developed new and innovative big flavor food and beverage features – from house smoked BBQ, traditional Mexican street food, and Hawaiian-style dishes – all celebrating the diverse culinary heritage of the United States, and honoring Los Angeles as a center of fabulous food culture innovation. Check out the offerings in the images below (click on image for PDF). Ice chests, coolers and other beverage containers are not permitted inside the Coliseum. Costumes are permitted and must be appropriate as determined by Stadium personnel and security services. Costumes cannot detract from the experience or enjoyment of other patrons. Masks or other costume pieces that in any way obscure the face are prohibited from entry. Face paint is permitted as long as it is not offensive in nature. Guests are advised that bulky clothing and/or costumes will result in delays at security screening outside the Los Angeles Memorial Coliseum. Guests will be asked to remove their costumes upon arrival at the gates to clear the screening process. Items that do not clear the screening process will be treated as banned items and will not be claim-checked at the gate. Costumes must fit within the confines of the guest’s ticketed seat and must allow for safe passage of fans through the seating row. Toy or replica weapons are prohibited from entry. Any item that is deemed dangerous or perceived to be dangerous, unsafe (spikes, sharp looking objects, mallets, etc.) or offensive will not be allowed in the Los Angeles Memorial Coliseum. Management reserves the right to deny entry to anyone refusing to remove dangerous or perceived to be dangerous pieces of a costume or clothing. Guest satisfaction is a high priority of Coliseum Management. Customer Service Booths are located at Gate 23, Gate 33 (south end of the Peristyle) and at the Coliseum Administration Building across from Tunnel 11. An additional booth is located on the concourse level at Stair 17. You can also reach a customer service representative by calling or texting 213-263-4007. Message and data rates may apply. Facility Management asks that all guests not to wear derogatory, profane or offensive clothing. Guests with improper clothing may be asked to remove the item, cover up the item or leave the venue. From the North via the 110 Freeway: Exit Exposition Blvd. – Turn Left on Flower St. – Turn Left on Figueroa St. – Follow Signs to the Coliseum parking. From the South via the 110 Freeway: Exit Martin Luther King Blvd. – Turn Left on Figueroa St. – Follow Signs to the Coliseum parking. The Express Lane exits directly to 39th St. and the entrance to Exposition Park. From the East via the 10 Freeway: Exit Vermont St. – Turn Left on to Vermont St. – Continue past the USC Campus – Follow Signs to the Coliseum parking. From the West via the 10 Freeway: Exit Vermont St. – Turn Right on to Vermont St. – Continue past the USC Campus – Follow Signs to Coliseum parking. The use of Drone aircraft or Unmanned Aircraft Systems (UAS) is prohibited at all times in Exposition Park and surrounding areas without first obtaining a permit and authorization from the State of California. Use inside the Coliseum is prohibited unless approved by Coliseum management and operators must meet the same requirements for the State of California. During the Coliseum renovations in 2018, the elevator is located at Tunnel 15 for all services and persons with disabilities. Escalators are located near Tunnels 4, 11 and 19. Escalators will reverse direction at the end of the third quarter. For the safety and security of our guests, re-entry is not allowed at any event. We want all our guests to enjoy the event. Please remember to be considerate of those seated near you, cheer constructively and be mindful of good sportsmanship. Behavior that is disruptive to others may result in ejection from the stadium. Fans are encouraged to report inappropriate behavior to Management Personnel. For assistance call or text 213-263-4007. Message and data rates may apply. In order to ensure a safe and enjoyable environment, we ask that fans refrain from the following behavior at all events. Fans are encouraged to report inappropriate behavior to management personnel. For assistance, call or text 213-263-4007. Message and data rates may apply. There are two first aid locations located inside the Coliseum at Gate 1 and Gate 16; and an additional aid station on the Concourse (upper level) at Stair 17. Please contact the nearest usher or security officer if medical attention is needed. Footballs landing in the stands as a result of play must be returned to the playing field. A Los Angeles Memorial Coliseum staff member will identify themselves and request the ball returned to the field of play. Failure to do so can result in removal from the venue. On Game Days, look for USC Trojans, the official USC Football souvenir magazine as you enter the Coliseum. The game program offers fans up-to-date information, game previews, colorful features, interviews, rosters, depth charts, stats, and much more! USC Football kickoff times are subject to change for television broadcasts. 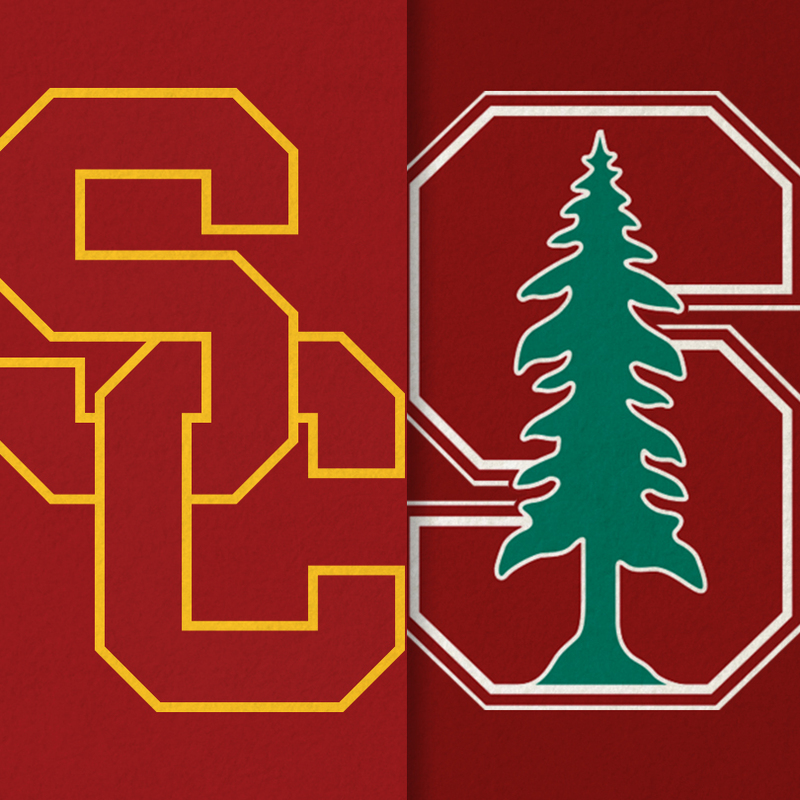 Visit usctrojans.com for updates. Gates 1, 4, 8, 19, 23, and 28 will open for guests two hours prior to kickoff time (open time subject to change). The use of laser pointers is strictly prohibited and will result in ejection from the venue. Looking for a lost item? Click Here to visit the Los Angeles Memorial Coliseum’s Virtual Lost and Found. During an event, lost items may be claimed at the Coliseum Administrative Building near Gate 11. Found items may be turned over to the office, or given to an usher or security guard in your section who will turn them in. For more information please call 213-747-7111 on weekdays between 9:00 AM and 4:00 PM. Guests are encouraged to instruct children in their group to find a stadium staff member if they become lost or separated from their group. Lost children will be taken to the Coliseum Administration Building located near Tunnel 11. To report a lost child please contact the nearest police officer, venue or event staff, team representative, or go to Customer Service located at the Coliseum Administration Building located near Tunnel 11. You can now shop for all the latest Trojan apparel, merchandise, and collectibles at the USC Bookstore shop located next to Gate 19 and Gate 29. Other merchandise stands are located at the Trojan Fan- Fest outside of the Peristyle end of the Coliseum before kickoff, or throughout the street level inside the stadium. To shop for the latest USC Trojan merchandise on non-game days, please visit the official Trojan online Fan Store at shop.usctrojans.com. With mobile ticket delivery your tickets are emailed to you immediately after your purchase. These tickets are optimized for display on your smartphone. You will receive two emails after your purchase – one will include links to access your tickets that can be scanned from your smartphone, and the other will be your order confirmation email. We recommend you save your mobile tickets to your mobile device. Order home game tickets online at www.usctrojans.com/tickets and choose mobile ticket delivery. All tickets for the same event will be in one link. There is no need to print your tickets! Just present your mobile ticket on your smartphone at the entry gate. USC Athletics scans all tickets at each facility using the barcode on each ticket. Treat each mobile ticket like you would any other valid ticket to an event. Mobile tickets are individually barcoded and will only allow one scan per entry so any attempts to duplicate, alter, or sell any copies of the mobile ticket may result in admittance being refused to the event. Mobile tickets will arrive as a link in the email which you will click on to download your tickets. All tickets for the same event will be in one link. If you are using any spam filters and want to ensure you receive the email containing your tickets, please add our email addresses (uscto@usc.edu, USC_TICKET_OFFICE@usc.edu, and tcktprnt@usc.edu) to your approved spam filter list. Please also set your email to accept attachments. Mobile PDF attachments may be used on any type of smartphone with a PDF viewer, such as Apple, Android, Windows, and Blackberry phones. Due to construction, there is no public parking in Exposition Park. For parking pass holders, Exposition Park Lots open at 7:00 AM. All USC Campus Lots and Structures open at 6:00 AM. Most USC Campus Parking Lots and Structures are open to the public and available on a first-come, first-served basis for $25. Free shuttles are provided from the Grand Avenue Structure (formerly USC Parking Structure) to the Coliseum. There are also a variety of privately owned and operated lots nearby the Coliseum. While you are welcome to use these lots, please understand that USC does not control these lots in any manner. ADA Accessible Parking (Subject to change) ADA Accessible parking is available in all USC Campus lots, as well as Lots 4, 6, and the Exposition Park Visitor Parking Structure. By law, these spaces cannot be reserved in advance and, on game days, are offered to guests on a first-come, first-served basis. Due to an extremely high demand for accessible parking, we are unfortunately unable to accommodate all of our guests, so please arrive early to ensure that you have a space in a lot. Please arrive with your state issued placard and identification, and parking personnel will guide you to your parking area. The fee for parking is $25. Please note: Left turn lanes are closed on game day, so plan your route to campus accordingly! There is no re-entry for parking. Vehicles may not leave and re-enter the parking lot. Vehicles parked on city streets are subject to citation. This includes Vermont Avenue, Bill Robertson Lane, Figueroa Street, Exposition Blvd. or Martin Luther King, Jr. Blvd. Public parking is also available in surrounding surface lots on Figueroa Street and Vermont Avenue at the Browning Street Garage located at Browning Street and Vermont. Parking may be available in other lots near LA Live and the LA Convention Center. Take Metro for transport to USC/Exposition Park. All persons and their belongings are subject to metal detector screening and bag inspection prior to entering the Coliseum. Guests are encouraged to arrive early to avoid delays. All prohibited items will not be allowed inside the Coliseum. The Coliseum is a smoke-free environment. Smoking and smoking implements are prohibited in any area of the Coliseum. Please do not conceal items. Have all items clearly visible inside an approved bag. All Bags must meet Bag Policy guidelines and are subject to inspection upon entry. For more information on the Coliseum Bag Policy, please visit http://www.lacoliseum.com/beclear. Lyft is our official rideshare partner. New users get $5 off their ride with code LACOLISEUM18. Take a Lyft ride to the game, and leave the car at home. After the game, exit Gate 19 and head north to Exposition Blvd and then west to Vermont Ave. Walk North on Vermont Ave to meet your driver. In all other locations, rideshare services are prohibited from entering Exposition Park area until 1 hour after the game. Only approved seat cushions may be carried into the Los Angeles Memorial Coliseum. Clear seat cushions WITHOUT pockets, zippers, compartments, or covers are permitted. Large seat cushions that have pockets, zippers, compartments, or covers are NOT permitted. If you see something, say something. Please report suspicious activities to local authorities (such as unattended backpacks, vehicle incursion or drones). Call 877-A-THREAT (877-284-7328) or notify police, stadium security or event staff. In case of emergency at USC, call (213) 740-4321 or 9-1-1. To ensure guest safety and enjoyment of all games, standing on stadium seats is prohibited. Standing with the intention to block someone else’s view or when others around you are seated is also prohibited by the Fan Code of Conduct. Sitting or standing in the aisles and crosswalks, or in ramps and stairways, is also prohibited. Smoking, smokeless tobacco and smoking implements (including, but not limited to cigarettes, cigars, pipes, lighters, vaporizers and e-cigarettes) are prohibited in all areas of the Coliseum. The use of smokeless tobacco is prohibited for all events (LAMC 41.50.1). Violators may be subject to eviction and/or citation. Strollers are prohibited inside the Coliseum. Much of the Coliseum seating is in direct sunlight during the day. Protective clothing and use of sunscreen is encouraged. Please use a lotion, cream or ointment based sunscreen from plastic tubes that are clearly marked and carried in a clear bag. Aerosol and metallic cans are not permitted inside the Coliseum. Complimentary sunscreen can also be found at customer service locations. Public parking lots in Exposition Park that surround the Coliseum are managed by the Office of Exposition Park Management, a department of the State of California’s Natural Resources Agency. Please help us keep a safe environment and positive guest experience for all guests in the park. Tailgating is defined as; the use of any item (including tables, chairs, free-standing canopies or umbrellas, awnings attached to recreational vehicles, coolers, barbeques, grills, games, generators, televisions, sound systems, food or drink, food or drink preparation or serving equipment, or other items as identified by the General Manager (or designee) for the purpose of an outdoor gathering by one or more people prior to, during or after a scheduled event. Tents or canopies exceeding an 8’ x 8’ footprint are not permitted. Tailgating is limited to the area directly in front of or behind your vehicle only. Box trucks, trailers, grill in-tow, or any catering service from an outside source, are not permitted in parking lots. Generators and grills must have a fire extinguisher present while in operation. Please use care when storing flammable materials and please be courteous to neighboring parking spaces in regards to noise and exhaust. Tailgating cannot impede vehicle or foot traffic. Tailgating may not lock or restrict access to portable toilets. The use or creation of personal toilets or unregulated bathroom facilities is prohibited. Tailgating will cease after kickoff. Excessive consumption of alcohol is prohibited. All guests must be in possession of a valid event ticket or credential. Glass containers or bottles are prohibited in all areas of Exposition Park. All drinks and items should be placed in plastic or disposable containers. Barbecue grills cannot be set-up in areas of overhanging tree limbs or areas that have mulched ground-cover or wood-chips. Barbecue grills cannot be left unattended. Makeshift barbecue grills or stand-alone fire pits will not be allowed. Open flames in the Visitor Parking Structure (VPS) are prohibited. Empty spaces may not be reserved or used for the purpose of tailgating. Appropriate receptacles must be used for the disposal of hot coals. Barbecue grills with covers are allowed. All Guest Code of Conduct and parking policies are in effect. These practices will be strictly enforced by on-site law enforcement and the Los Angeles Fire Department. Failure to follow these guidelines may result in a revocation of tailgating privileges. For Customer Service or Security, call or text (213) 263-4007. Message and data rates may apply. Roadside assistance is available before and after events. Please contact Classic Parking at 213-749-5654 for assistance for battery service and lockouts. © Copyright 2019 University of Southern California. All rights reserved.